I know what you’re going to say: “Oh no! Not another Mitsuoka Galue!” Too much of a good (?) thing could be hard to stomach, and I would hate to put off any of you from loving the oddest Japanese car marque in history. 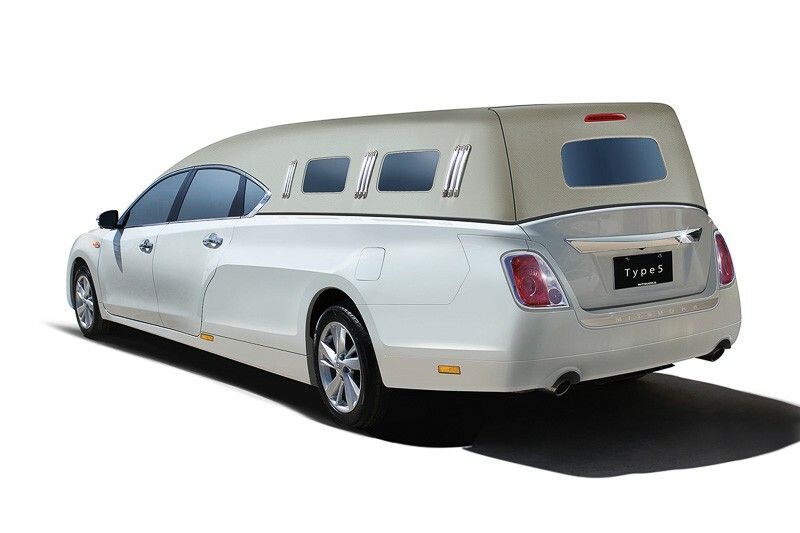 But this is the limousine version, guys! Exclusive, elusive, expensive, excessive and even stranger than the “normal” Galue, which I’ve covered in CC a few months ago. So let’s take a good look at the best Mitsuoka has to offer. 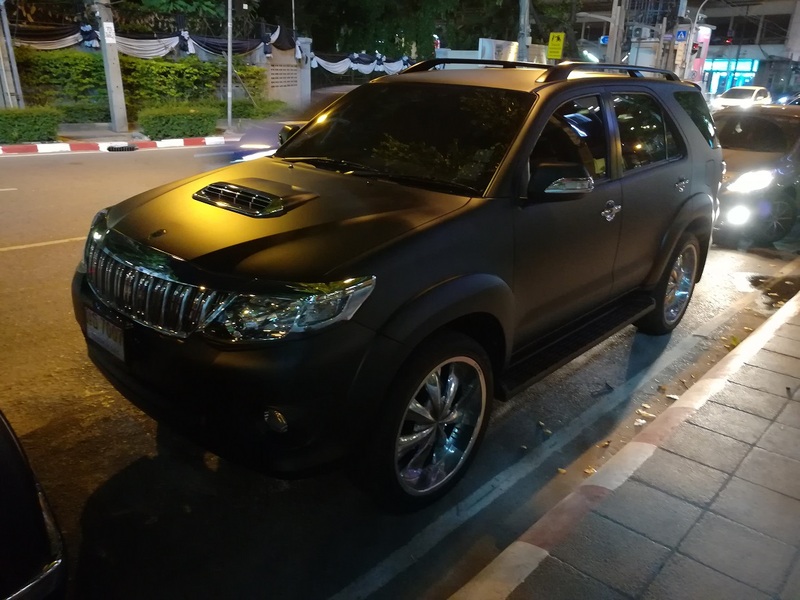 I chanced upon this Infinity-based monstrosity last night, as I was walking in Bangkok. I’m here for a week of R & R with my family – it’s the easiest place to get to from Myanmar, so a lot of expats like to escape here once in a while. 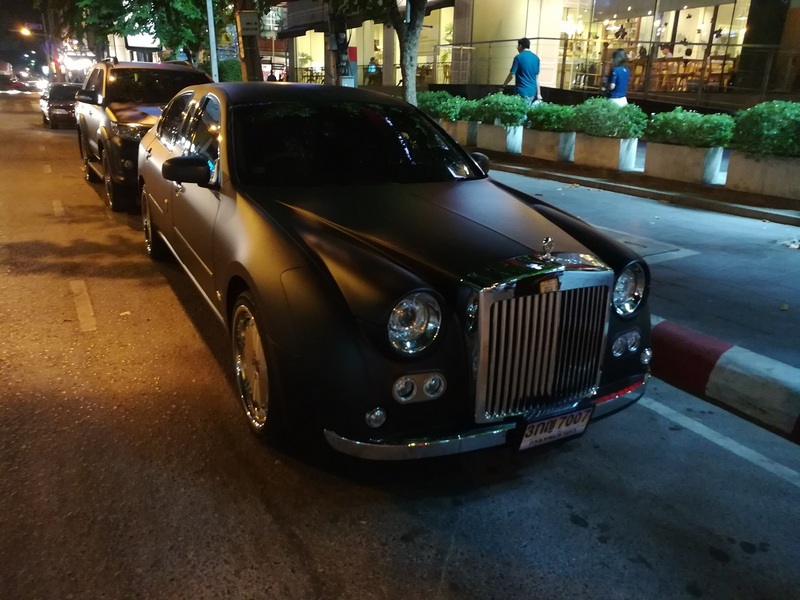 And Bangkok has given me a few interesting automotive surprises before, but this one was a whopper. This is my first nighttime shoot, but thanks to my new phone, I managed to get a few decent pics. 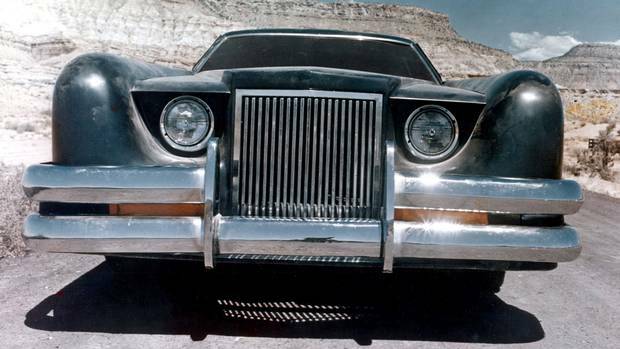 The Galue Limousine is truly massive in the metal. 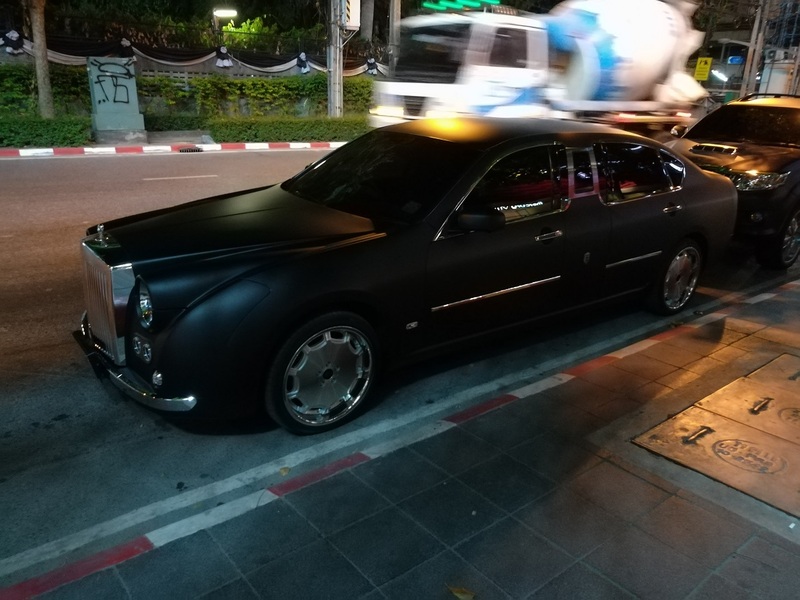 The matte paint made the car even more daunting, like a bug-eyed whale parked on the curbside in the heat of the night of the Thai metropolis. 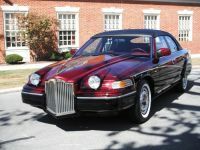 The Galue III limousine was launched on an unsuspecting public in late 2008. I’m unaware of production numbers, but they must be very low indeed. 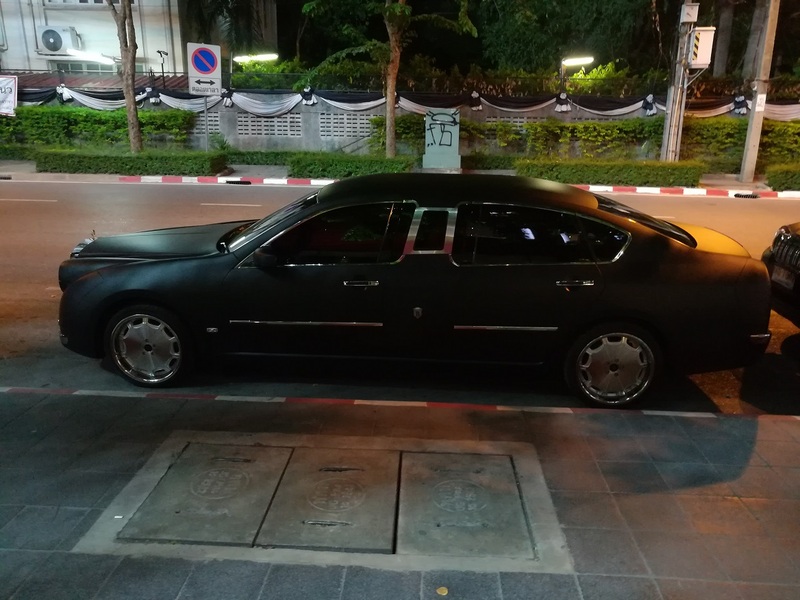 At some point, the Mitsuoka importer in Thailand decided to add the limo to their line-up, and the car certainly was at the Bangkok Motor Show in 2013 (which is why I prudently hazard a guess at that model year for this car). Still based on the Nissan Fuga / Infinity M35 with the 3.5 litre V6, the Galue limo stretches the Nissan platform by 70mm (about 3 inches) and raises the roof ever so slightly. The price in Japan for these things is upwards of US$100,000. 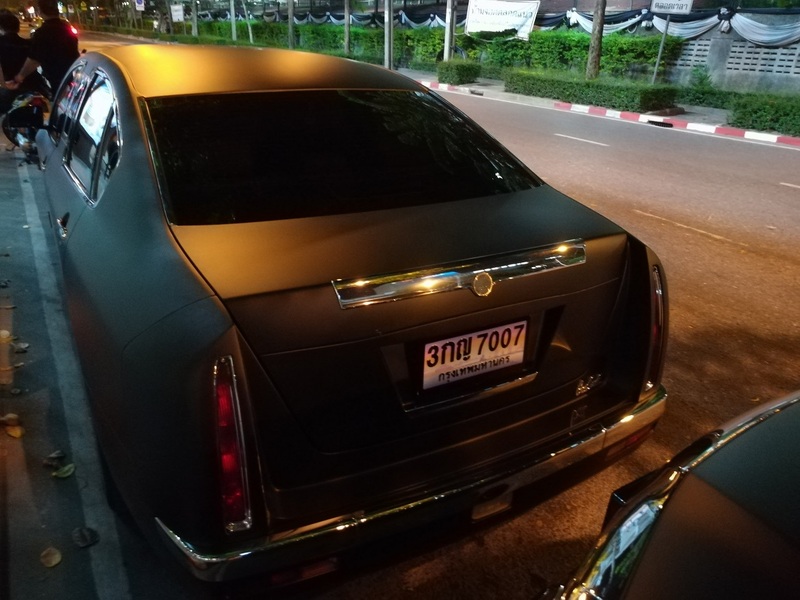 This means, if my info on Thai import tax policies is still accurate, that the price in Bangkok for this Galue would be about US$400,000 (300% luxury import tax on vehicles, perfume, alcohol, etc.) In reality, it might be closer to US$300,000 if one figures the Japanese price includes VAT, which would not be included for exported cars. Still, that’s quite a packet of dough for this bucket of bolts. So who would have the kind of money (and the kind of taste) for a long-wheelbase Nissan with a Bentley grille and a matte finish? Well, it seems the guy who ordered this car was so proud of it that he had it badged. On the stretch, too, for good measure. Mr Kiti must lead a charmed life, surrounded by beauty and long-legged attention. No wonder he needs a limousine with A/C, a bar and tinted windows. 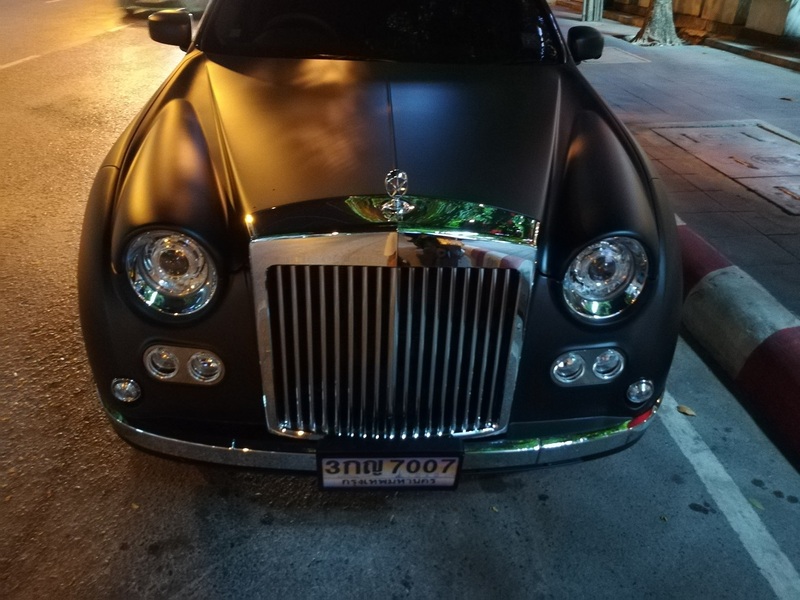 So if this Mitsuoka’s a-rockin’, you know what to do… Interestingly, there was a late-model Toyota Fortuner in identical matte guise parked behind the limo. 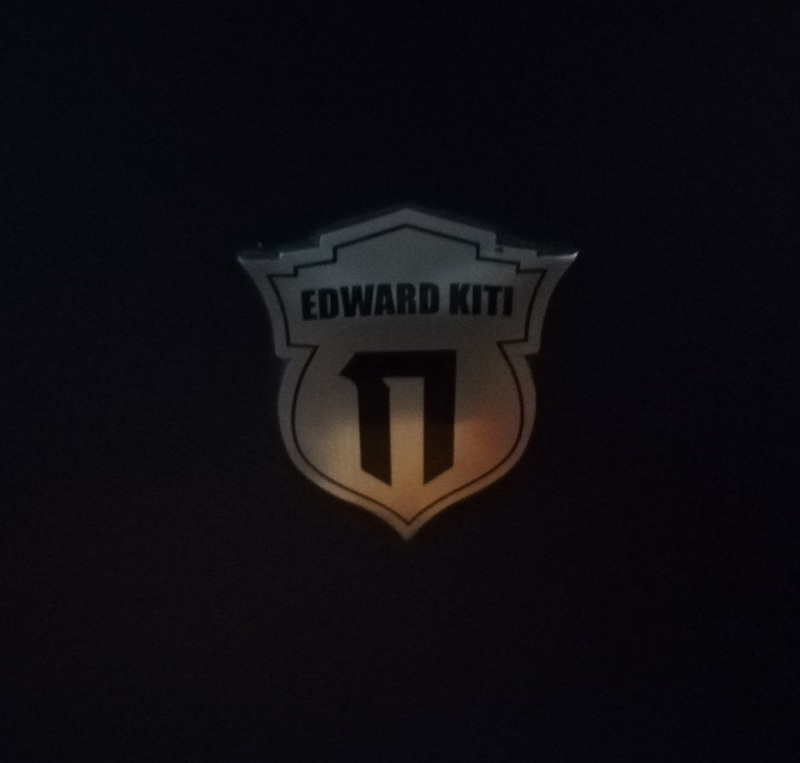 And lo and behold, the Fortuner also had Edward Kiti badges, both front and back. No doubt the entourage and flunkies (or the chaperones?) get to ride in this one, as well as the bodyguards (if need be). The grill might be inspired by Bentley, but the tail lights are pure Cadillac. Galue is thicker than water..
To borrow a line from Peter Egan, if bad taste were dynamite I wouldn’t want to smoke in there. At that price, it is not a very good Galue. As for the looks? Just . . . wow. Isn’t this the same company that used to re-body small, very small Nissans, like the Micra and Sentra? And since no one has asked….is Edward Kiti the father of Hello Kitty? Those side windows, I immediately thought of 70’s Mazda Cosmo Coupe. Me too. Not in a good way. Personally I like it. It visually separates the staff and passenger compartments while at the same time integrating them in an unexpected manner. Very different from the big-extra-window or big-blank-panel that make most stretch jobs look like automotive dachshunds. I think it’s the best part of the whole design. At the first glance at the first picture, I thought this was some kind of mutant Citroën. And it looks awesome, especially in the matt black, I actually like it, a lot. The front end, however, is horrible. This is, after all, from the company that makes or made the Viewt. Surely you have miss-judged Mr Kiti ? As president of the Thai Modelling Industry he must be engaged in the manufacture of miniature automobiles/trains/aeroplanes…. Well, this is a car that’s unlikely to produce a CC-effect sighting any time soon! I’m still recovering from the earlier Mitsuoka CC, which for some reason has stuck in my mind like Galue. Truth is sometimes stranger than fiction, and these Mitsuoka cars are a good example of that. 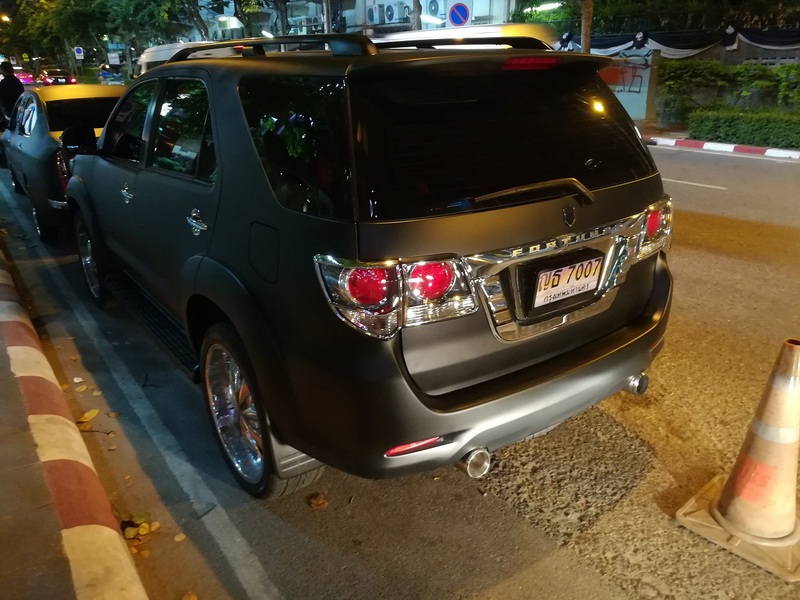 A Nissan Fuga is nothing special to look at its a kind of generic Nissan shaped blob, but I’m pretty sure it didnt deserve this treatment, Mitsuoka had gone from bad to worse, I wonder what they’ll come up with next, I needed a good laugh thanx. I kneeeew it reminded me of something!? 2013 model and yet they borrowed the taillights from a 94-99 Deville? I have to wonder whether it would look better in a gloss finish. Under these lights it just looks like a bad respray. 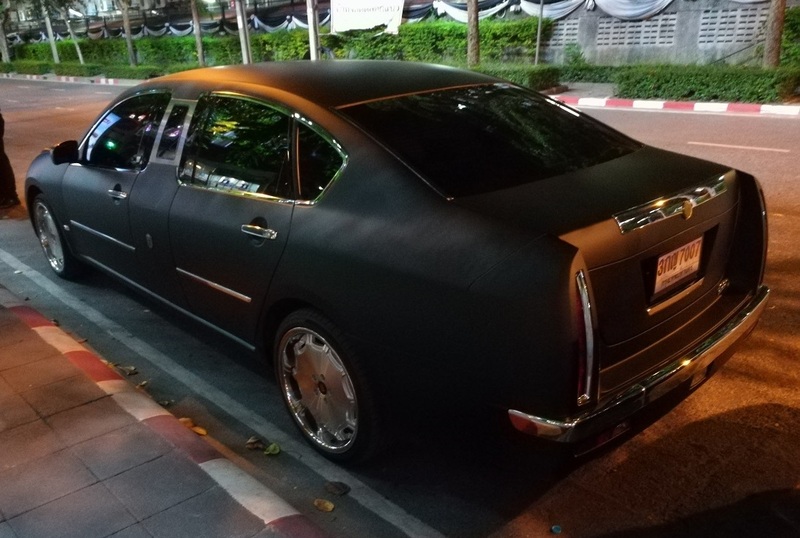 While matt black suits some shapes, on the Galue limo it just looks tacky. Just saw one in gloss – looks much better. Just picture it in resale red. If this is representative of the models he has to offer, well I guess he has a long term loan with low monthly payments on his ride- it’s the only way he could avoid getting it repossessed! Would you repossess something that looked like this? Final number “7007” plates on both “cars” but the first two or three digits are not readable to this reader. Are those first digits a way to avoid tolling in the HOV lanes or something? 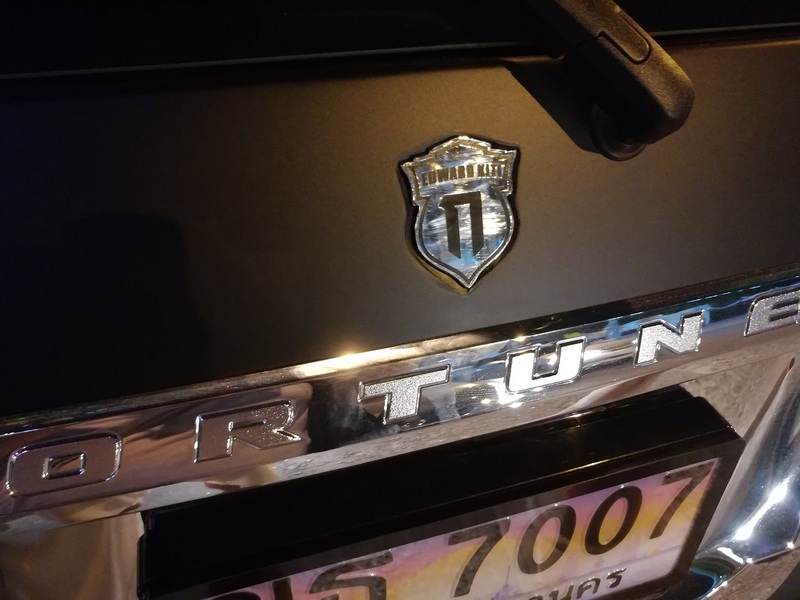 Maybe I just don’t get Thai license plate symbols. Can I say that I was actually thinking of this car yesterday, and been eagerly awaiting the next article on it? I stumbled on the original Galue CC a month or so ago and haven’t been able to get the odd name out of my mind…I just love how something like this can only come out of otaku-driven Japan. This example looks rather unfortunate in matte black (a sentiment I share with all cars in that color) because the ‘regular’ versions of these Mitsuokas do look impeccably finished, taste notwithstanding. EDIT: Just read that they are around $100,000 in their home country… what would a true Rolls run there? I remember a comment on the other article speculating that these were a more “attainable” alternative to importing the real thing. I actually think it would have been easier to stomach had they gotten the grill/headlights proportions better. Make them both smaller and drop the lights a touch and it almost passes for what I’d call “sort of OK”. Only if I had ingested some ‘shrooms could that limo look normal, OTOH I would​ actually DD one just for the sheer WTH?!? looks I’d get. ? Strange.I`m at a loss for words. When I first saw this I was sure that it was something from the imagination of Bruce McCall. I’m still not convinced that this is not some sort of subtle joke, poking fun at people with more money than good taste. Still better than the Crown Vic “Packard”. But this Altima-based “Galue 5” hearse (complete with Fiat 500 taillights) takes the cake.